Citizens on both sides of the Reston Dog Park issue spent about two hours speaking to the Reston Association Board of Directors on Thursday. In the end, the RA Board decided to speak some more, suggesting that they further discuss noise complaints and possible mitigation measures with the Fairfax County Park Authority. That’s because that’s all RA can really do. The off-leash dog area, the only one in Reston, is located in Baron Cameron Park, which is Fairfax County Park Authority land. Reston Association has no authority over the park, RA Attorney Ken Chadwick confirmed at Thursday’s meeting. Still, some of the residents of Longwood Grove, a development of single-family homes located across Wiehle Avenue from the dog park, said they were seeking RA’s help in their ongoing battle to get the dog park moved. Callaghan was among seven individuals who sought legal action to have the park shut down in recent years. That case was dismissed in a Fairfax County court. She maintained in a presentation to the board Thursday that the barking of dogs at the park “degrades the quality of life” for Longwood Grove residents. Callaghan also gave a history of the dog park. She pointed out that it was never approved by the Fairfax County Planning Commission, was intended to be temporary, and that many Longwood Grove homeowners purchased their homes prior to the dog park’s opening in 2001. She also said county officials — including the park authority and Fairfax County Police have continually passed the buck in regards to evaluating noise levels and responding to complaints. Suggested new locations include Lake Fairfax Park, another Fairfax County Park Authority park that is farther away from homes; or any available and appropriate Reston Association land and participate in a land swap with the county. Neither of those are likely to happen. FCPA Chair Bill Bouie said in a letter to RA that the park authority has no plans to move the dog park. He said the park authority will look into other measures of noise abatement at Baron Cameron. Some of the suggestions offered by citizens and a representative of Reston Dogs, a nonprofit that for years administered the park, included greater rule enforcement; more separation between big and small dogs; and user fees and registration for better tracking of repeat offenders. There was lengthy testimony from citizens on both sides of the issue on Thursday. Jonathan Campbell, a resident of Vantage Hill, spoke poignantly about how adopting a Labrador Retriever after he was injured in a bike accident and confined to a wheelchair has restored some normalcy to his life. 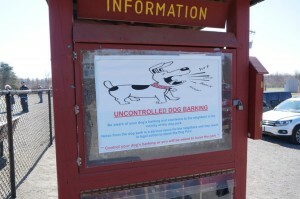 Another resident and dog park user said the issue has become an embarrassment for Reston. “I feel there are other priorities in our community that need our attention,” she said. Carrie Sawicki, a Longwood Grove resident of 22 years, said other residents should try and see the issue from the neighborhood’s eyes.